Don't Fear Technology, Embrace It! Our October Dinner Event guest speaker, Judi Fallon, is the Alannah & Madeline Foundation’s Schools Program Manager. 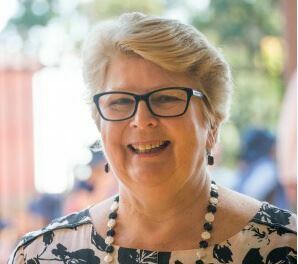 She is responsible for the Framework's development and implementation in all schools across Australia. Judi has extensive experience in education. She was a teacher for 12 years and a school principal for 10 years in the Victorian Education Department primary school system. Judi was involved in the Eleanor Davis Women in Leadership state-wide school program for women for four years during her career, as she realised the important role mentoring played in inspiring high potential aspirants. Judi then moved onto mentoring women in school leadership roles within the Barwon South Western region for two years. She was instrumental in successfully helping to encourage these women by providing them with expert advice and leading by example. Judi’s commitment to students with special needs was highlighted during her involvement in the Youth Service Cluster Leader program from 2003 to 2007. During that time, she focused on getting the schools, local shires and agencies on board, to help make a difference in these students’ lives. Background, mission and vision of the Alannah and Madeline Foundation. What does it mean to be eSmart? What role Judi has at the Alannah and Madeline Foundation. The Alannah & Madeline Foundation is a national charity protecting children from violence and bullying. Every child will live in a safe and supportive environment. To keep children safe from violence. Our key objectives are to care for children who have experienced or witnessed serious violence; reduce the incidence of bullying, cyber bullying and other cyber risks; and, advocate for the safety and wellbeing of children. Our programs are in one third of all Australian schools, and almost half of all Australian public libraries (reaching all 1,500 within the next three years) and we support 9,000 children in refuges or foster homes across Australia every year. We have reached more than 1.5 million children and their families nationwide since the organisation was established in 1997. The Cape Kitchen boasts breathtaking views of the Southern Ocean and coastline and presents a menu focused on what’s in-season, introducing unique Australian flavours and showcasing local produce at every opportunity. The philosophy underpinning the dining experience is reflected in an all Victorian wine list featuring a selection of boutique local wineries. Above: The spectacularly located and highly innovative Cape Kitchen are hosting our SBWN dinner event this October.